Later topic: Iowa City Press Co-op -- You're Invited! Show us your working space! No matter how small or disorganized or untidy or unfinished…. 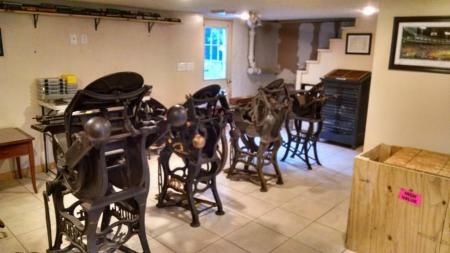 Show us your “letterpress space”! 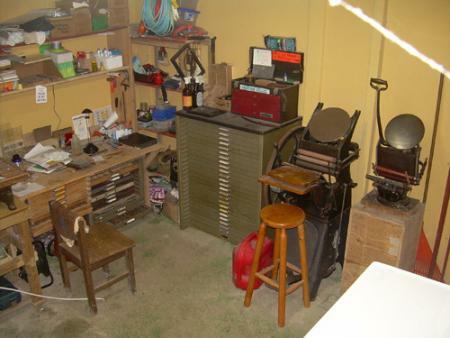 A young friend of mine wanted to film some of my presses running, you can see it on you tube, “the linotype and printing press jig - you tube” it only shows about half my letterpress shop but he did a great job. This is Ad Lib Press and Green Goat’s Press up at about 3900 feet on the side of Volcan Turrialba in Costa Rica. This is a little clip that was made last month about the Officina Athelstane. Excuse the printer’s ramble. 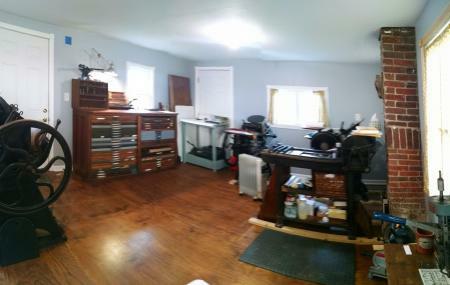 I think the Briar Press wrecker of images will probably reduce my image to a postage stamp, but I’ve attached a panorama of my space. It’s a complete disaster, fortunately it’s a little less of a disaster right now than in the photo. The ceiling and one wall are unfinished, but it’s a start. I don’t have room to get far enough away so that you would have a clue as to what you are looking at! Love seeing all of these spaces! 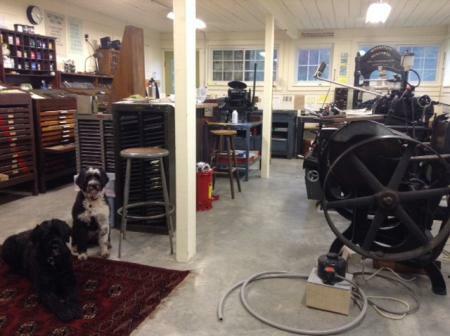 Getting set up in my little barn in Monkton, MD- still moving in another ton or two of equipment! I hope that Thompson platen is in that final ton or two! Petspo1, you need to eliminate the commas from your filename to get it acceptable. Or just shorten to something like “mypresses” as BP doesn’t accept punctuation in filenames.